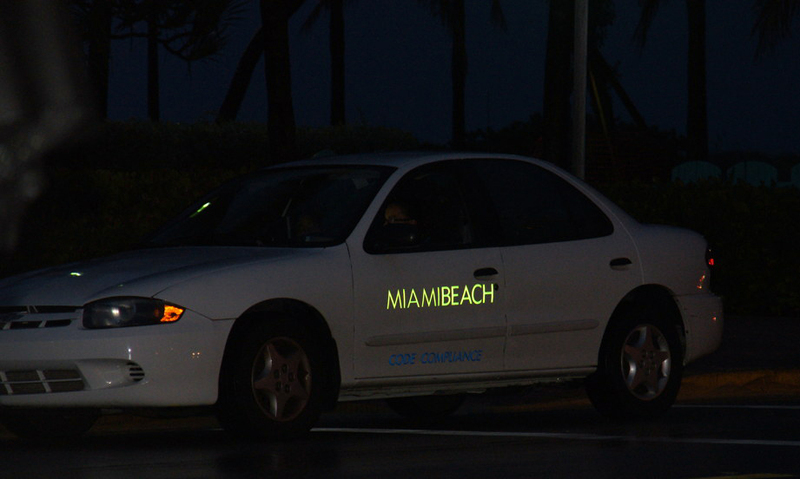 A few years ago, we had the opportunity to travel to Miami with two-for-one airfare. After thinking about it for a few seconds…we are on our way to Florida! Okay, a confession: this is a few years ago, and we are flying coach. Sad, but true. Still, at half-price, it is worth it. We are flying outbound on American Airlines 757-200 to Dallas, TX, then AA 737-800 to Fort Lauderdale, FL. Return trip is on AA MD-80 from Fort Lauderdale to Dallas, then AA 767-300 back home. 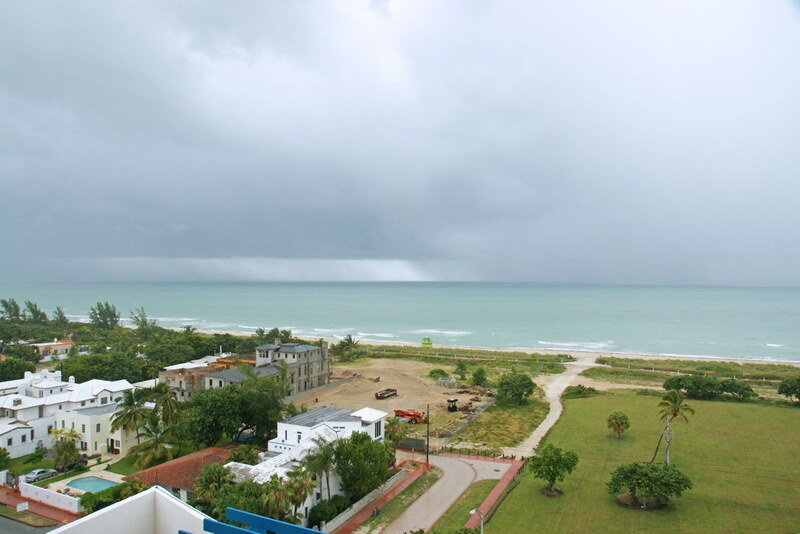 Using VRBO, we are staying at a property in North Miami on Collins Avenue, just one block from the beach. The view from our room toward the Atlantic Ocean. Notice the rain in the distance. One thing we notice right away: it rains here. In southern California, clouds are rare, and rain is rarer still. In Florida, clouds mean rain. The good thing is that the clouds drop their rain and don’t linger; the sun is shining shortly after. And, since it’s so humid anyway, many folks ignore the falling water, since it doesn’t make their clothes much damper. 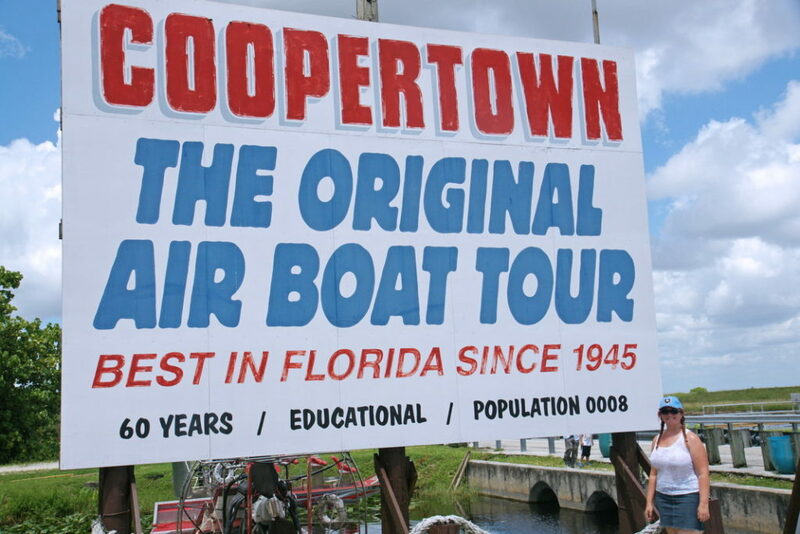 After settling in, we jump in our car and drive a short distance to Coopertown, population 8. The address is 22700 Southwest 8th Street, Miami, FL 33194, but don’t let that fool you: it’s in the middle of nowhere. And we are here to see alligators. They have an alligator farm, where the creatures can be viewed from safely behind a chain-link fence. These fellows look intensively aggressive, but it’s an accident of having a permanent scowl; in fact, they are as dispassionate about humans as every other wild animal. 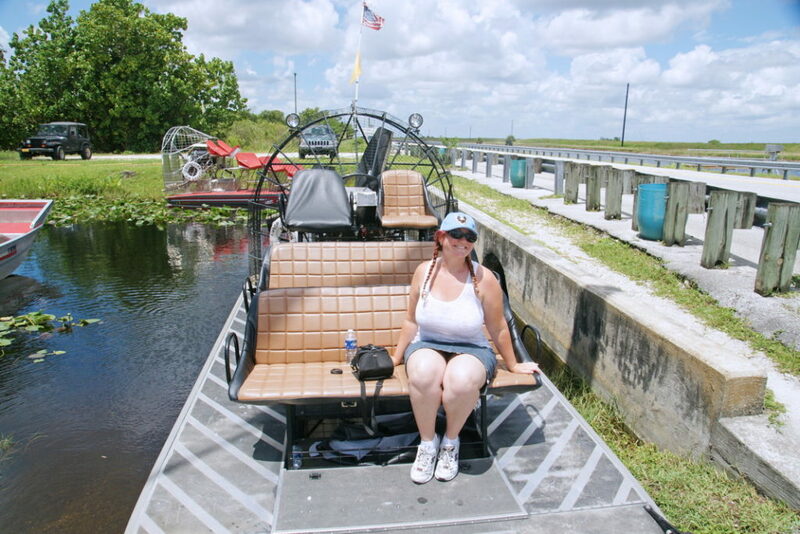 We await in our carriage, a private airboat. The view behind us as we travel the Everglades. 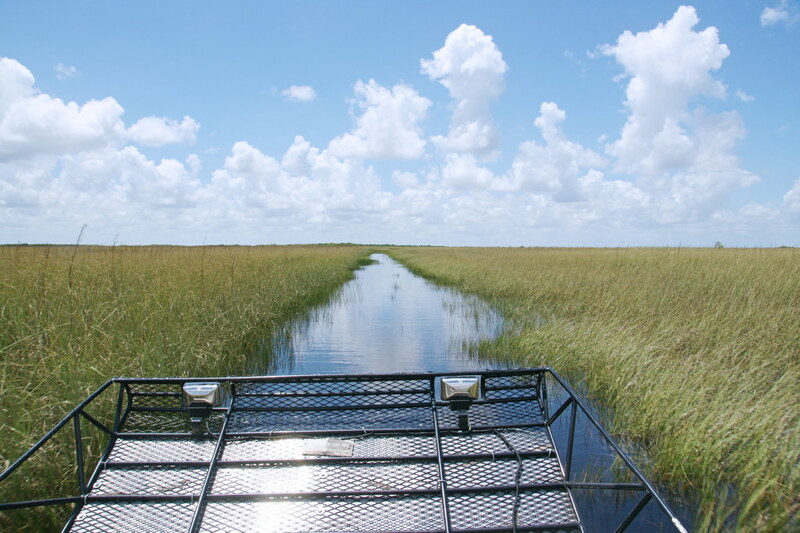 We ask our guide if it’s possible to get lost in the seemingly endless vista of grass in the Everglades. He points out that, if you look carefully, the grass is always slightly more lush towards the north. In addition, the scarcity of trees means that a single tree can be a reliable sign post. 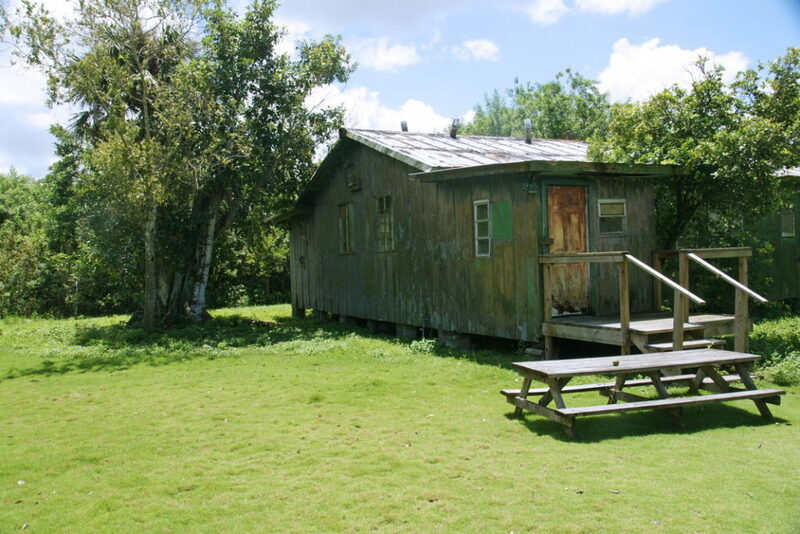 Island Living in the Everglades. 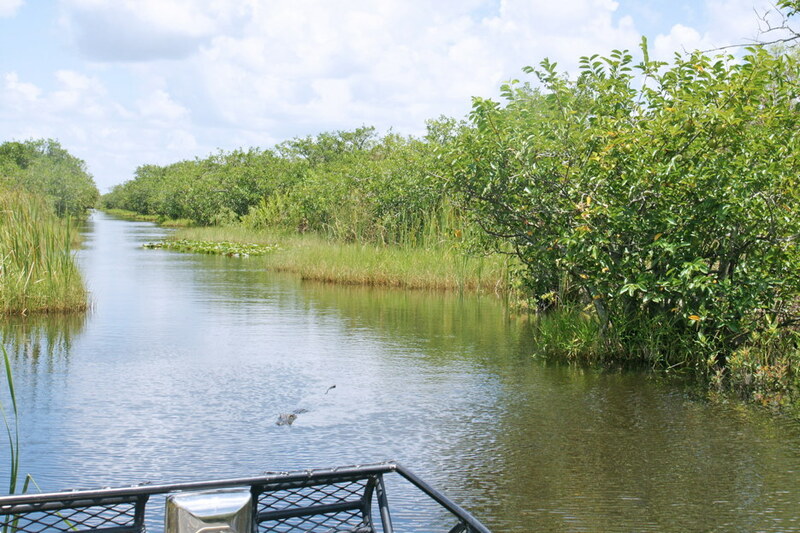 The first stop is a small island where — our guide explains — scary swamp movies are filmed. Okay. 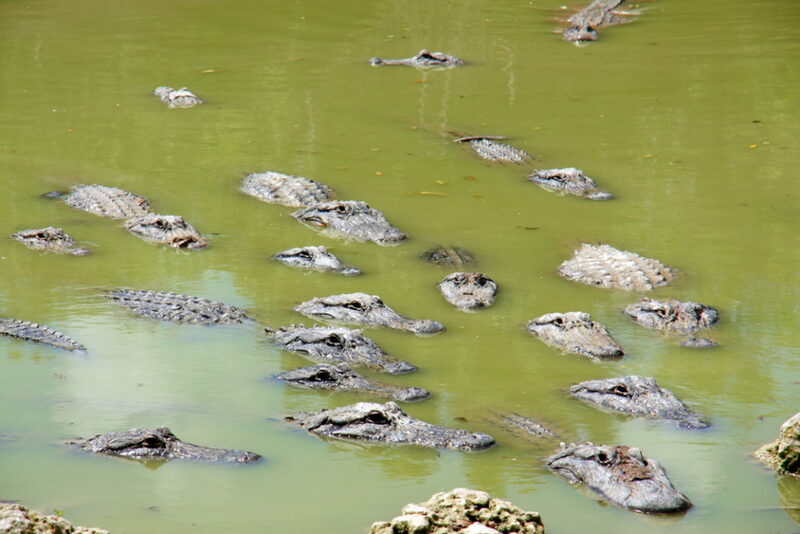 But we are here to see the alligator, so we move on. 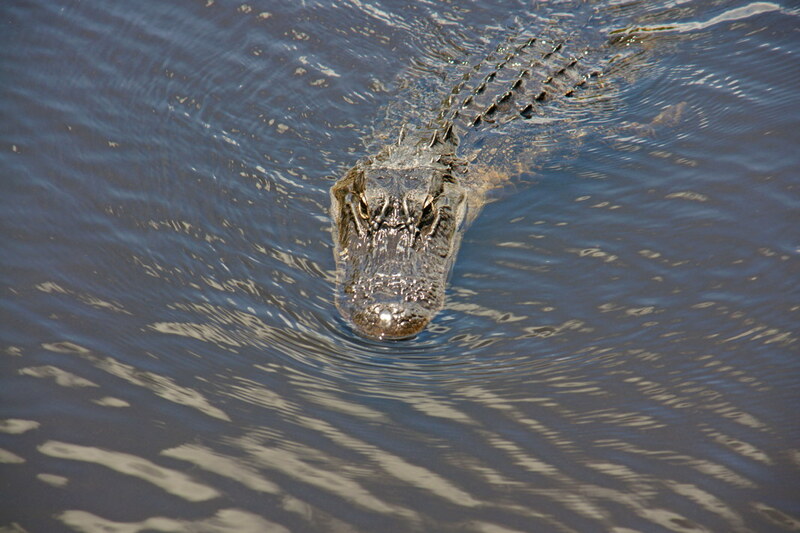 An alligator swims towards us. After a while, our guide stops the boat and throws in a large marshmallow. Immediately an alligator approaches the boat. I ask him if it’s legal to feed them, and he asks me if I’m a law officer. I let the matter rest. 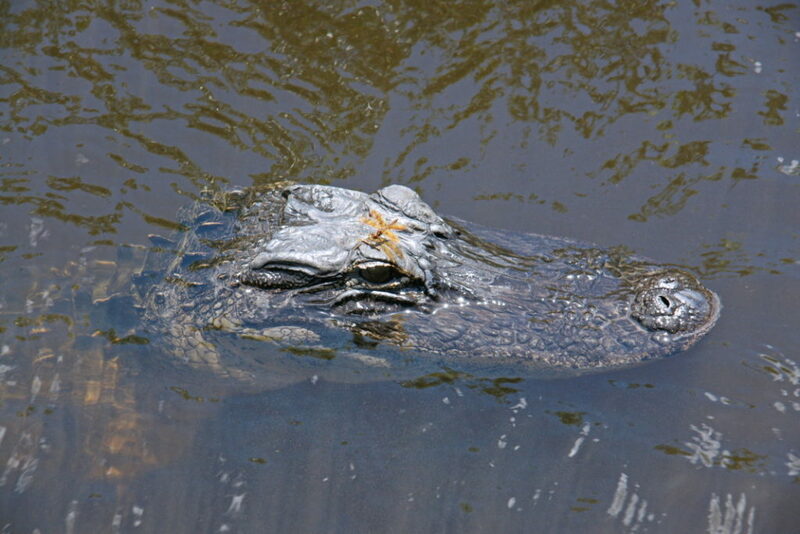 These alligators are small, only about 6 feet long. The animals are beautiful, shiny black, moving gracefully through the water. Their lack of expression belies the fact that they are completely aware of us and what we are doing (feeding them). 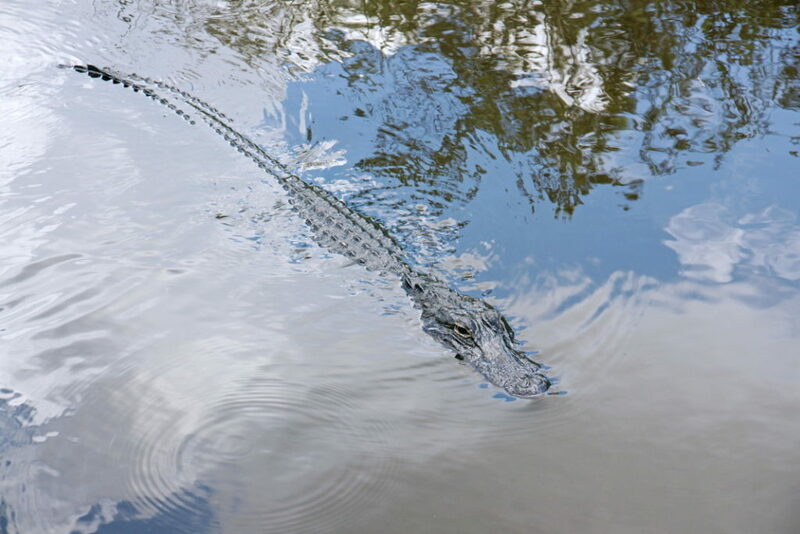 The alligator swims gently through the water. The alligator’s eyes are not placed as most predator’s eyes: directly in front to facilitate focus. However, this does not inhibit their ability to see directly ahead. You might think alligators to be dangerous, but this dragonfly doesn’t. 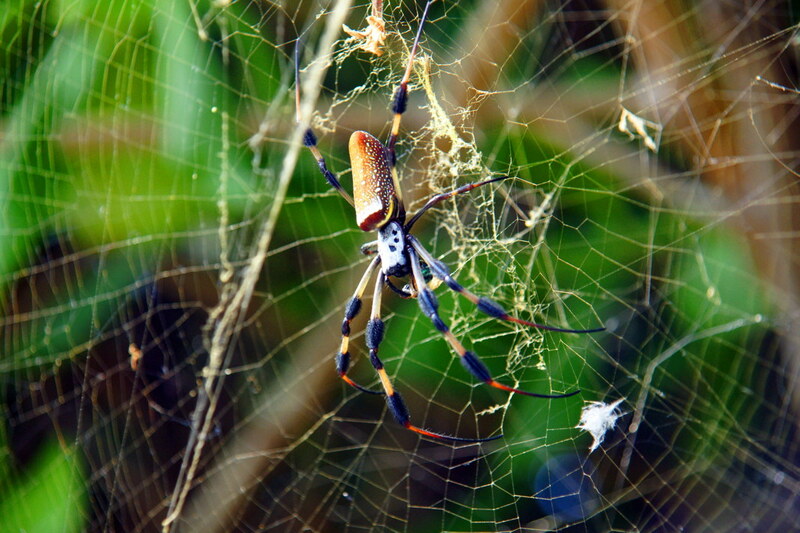 Another of the beautiful creatures of the Everglades, the Golden Silk Orb-weaver. 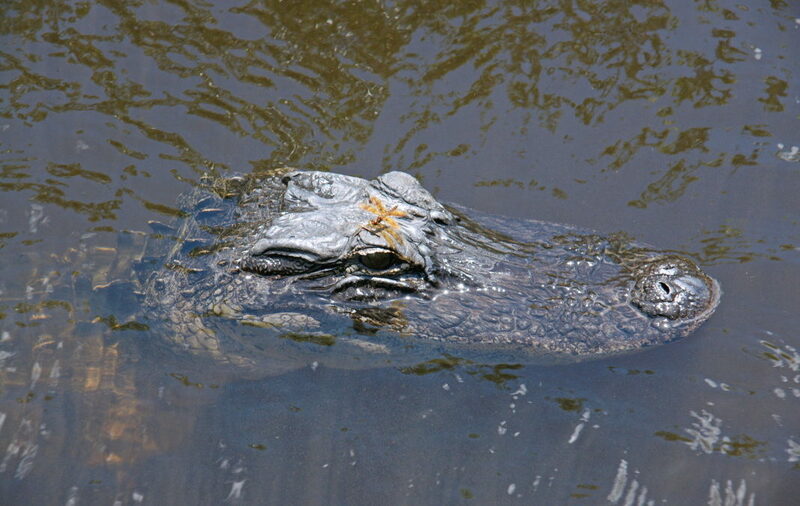 Not everything in the Everglades is an alligator. We see a beautiful spider and get a close-up. Far away from downtown Miami. We leave land behind. Note the warning signs: go slow. The water is shallow, but so clear that we can see the bottom. The landscape is beautiful, so lush. It’s like a postcard, but better because we are actually here. 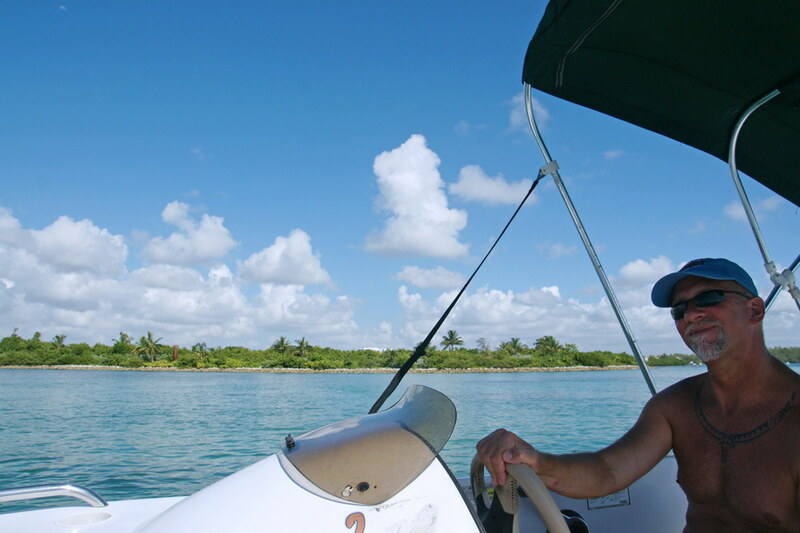 We cruise the inlets, admiring the lovely houses and boats. We seldom see people, however, probably due to the humidity, which seems to be 99%. Swimming in the middle of the bay. 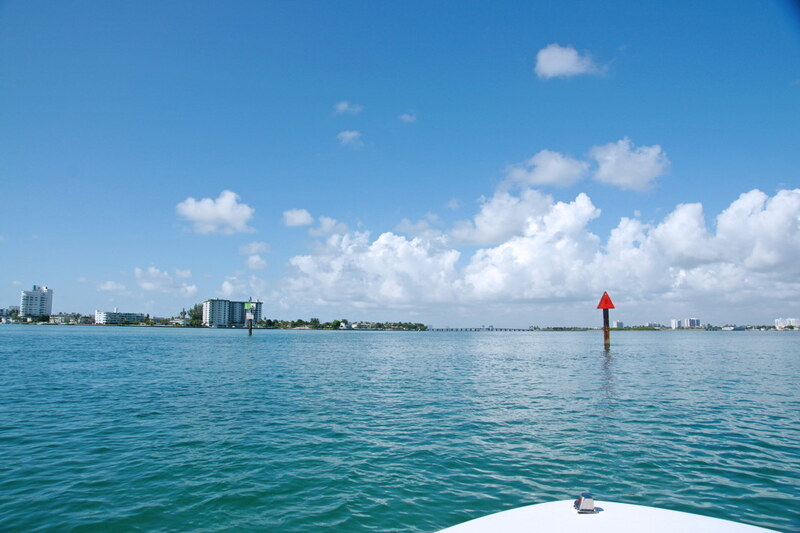 A wonderful part of cruising in Biscayne Bay is that we can drop anchor and jump in. There is a slight current, but nothing we can’t handle. 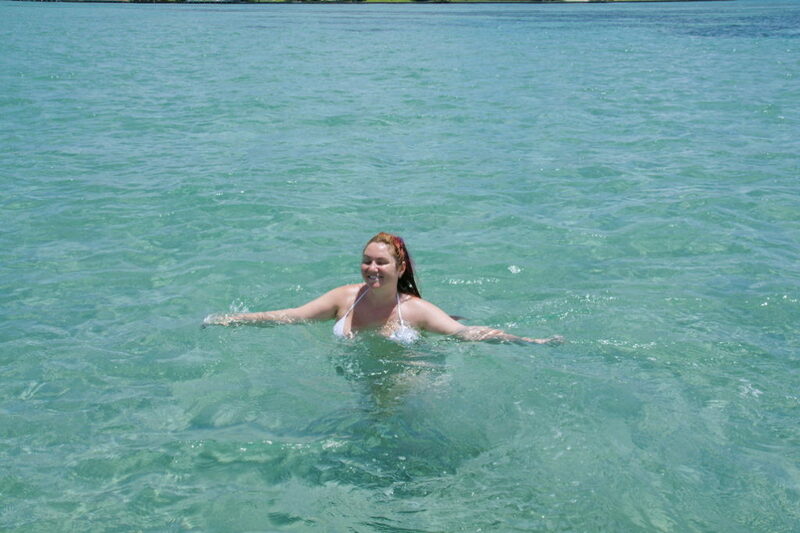 The water is perfect for cooling off on this warm Florida day. 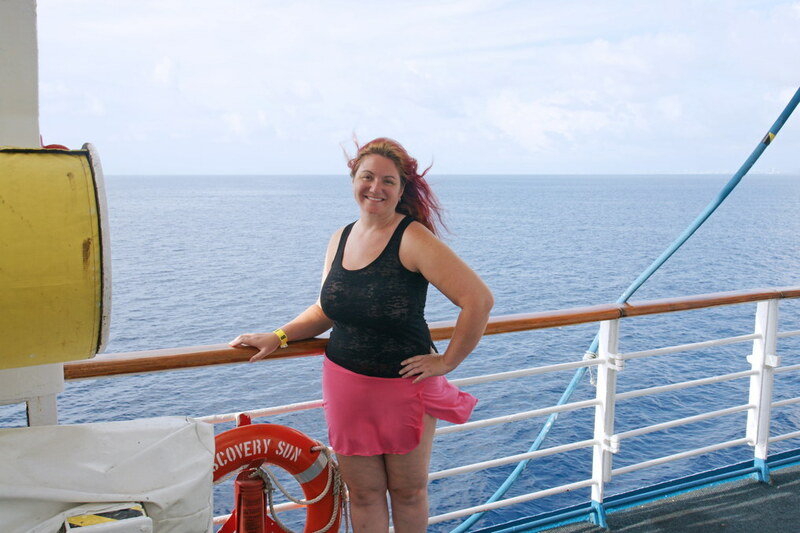 Aboard the Discovery Sun cruise ship. 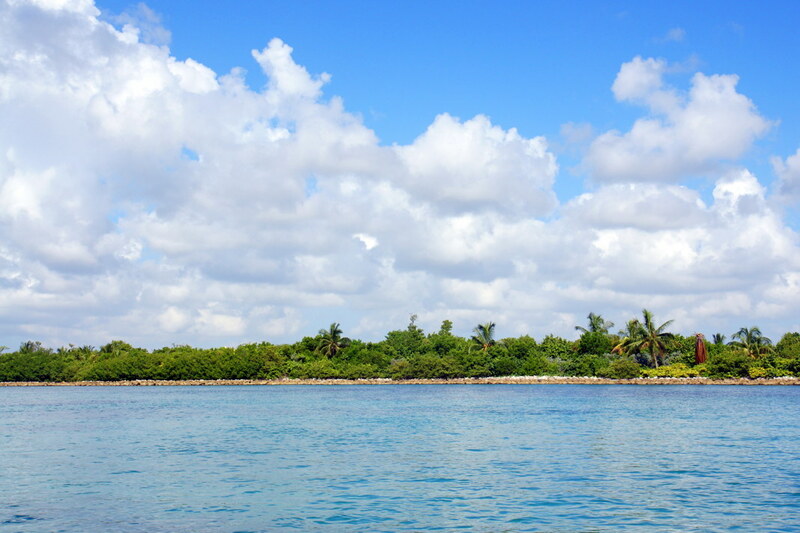 Next on our adventure is a trip to the Bahamas! We booked with Discovery Cruise Bahamas, boarded the Discovery Sun, and we are off! The ship specializes in day cruises, but also carries passengers who intend to stay longer on the island. 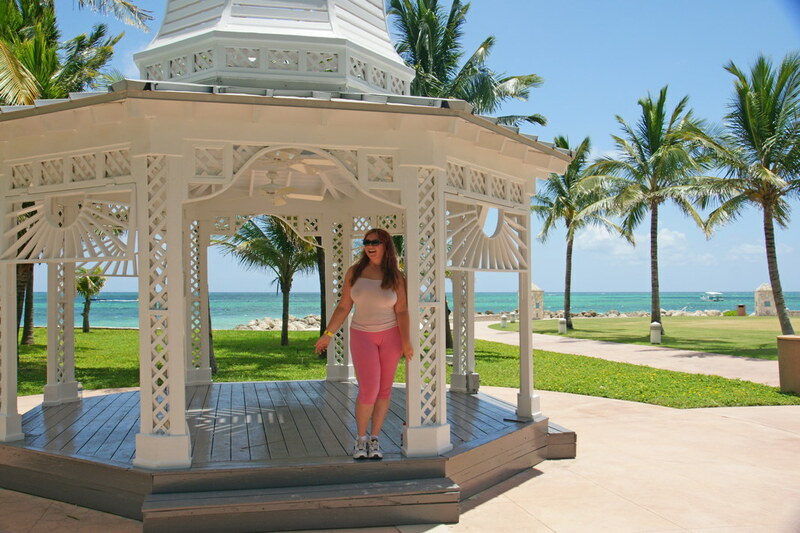 A beautiful gazebo at the Grand Lucayan hotel. 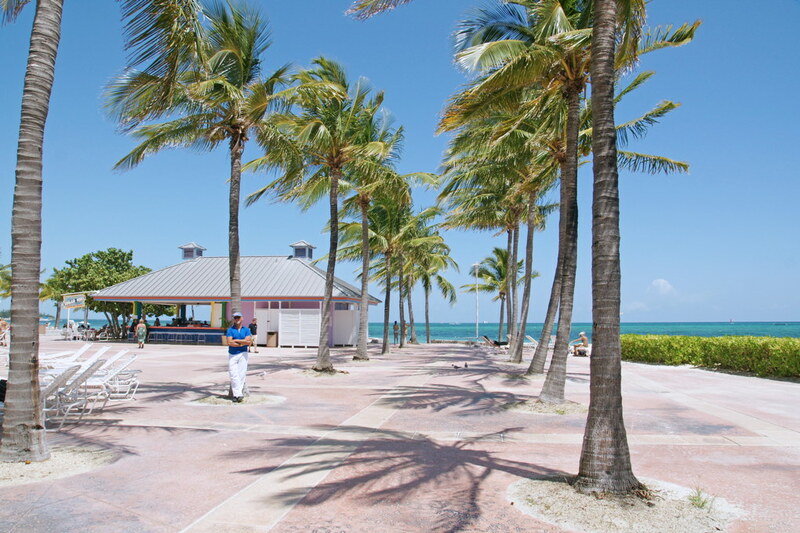 We disembark in Freeport, near the Grand Lucayan hotel. It’s beautiful here. The Grand Lucayan swimming pool. The hotel has an old-world aspect to it, limestone columns decorating the grounds. We tour the hotel and the surrounding area. Oh, well, Maybe another day. We’re off on the road to Key West! The next day, on a lark, we jump on the car and drive, eventually heading south. And we keep driving. A few hours later we find ourselves in Key West. On the Key West boardwalk in a Marilyn Monroe dress. Key West is humid. There, I said it. Hot and humid. But it is picturesque, and then some. Daydreaming sculpture at the Key West Museum of Art & History at the Custom House. We walk around the tourist areas, enjoying the day. 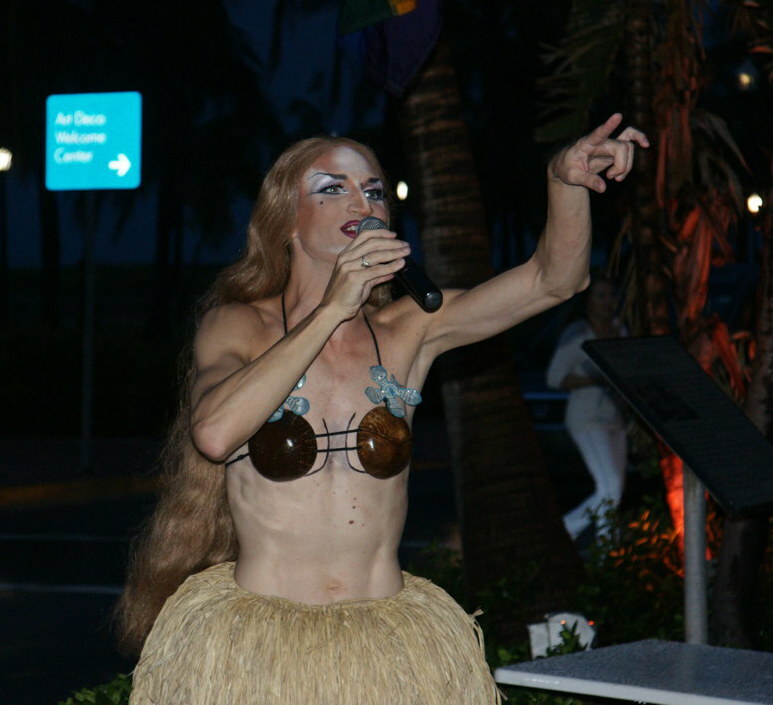 A local tells us to check out the Garden of Eden Key West bar, top floor. Key West can be done in a day. It’s only seven square miles in size, and the tourist part is smaller still. But it’s been a long day, so we stay overnight at an inexpensive hotel, then drive back the next day. Let’s see a show! 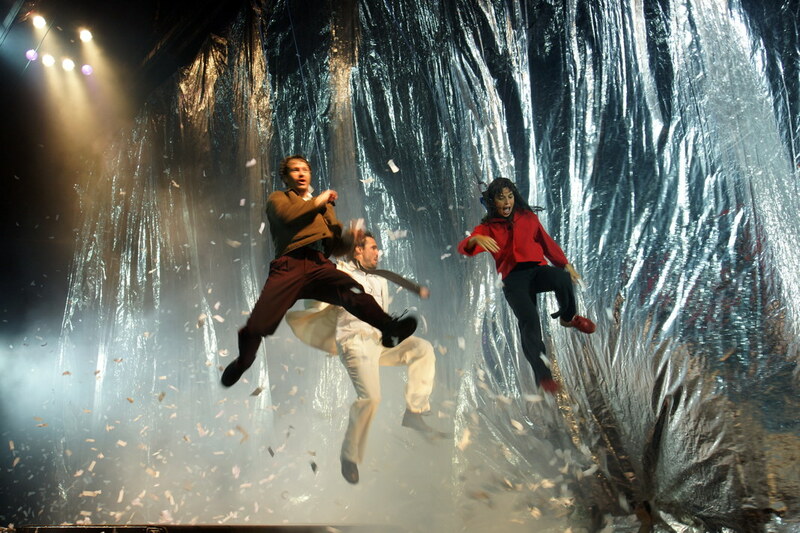 We check the listings, and pick Fuerza Bruta, because of course we do. We don’t quite know what to expect, but that’s the fun, right? 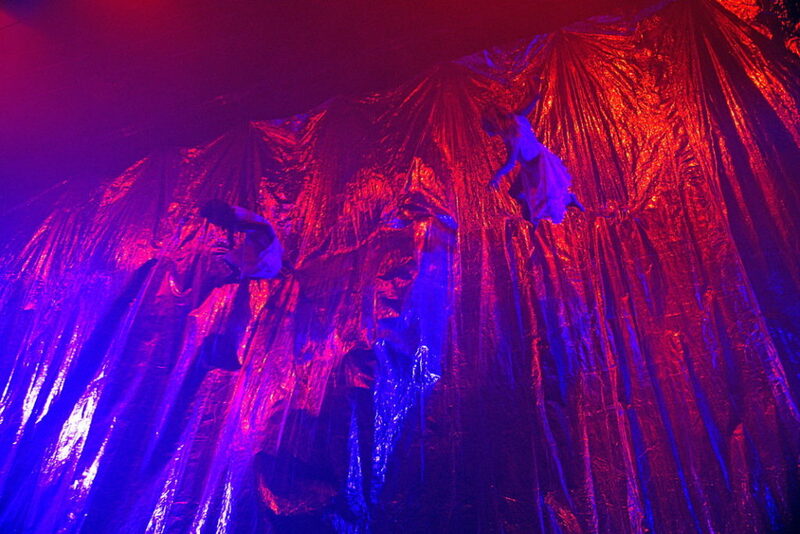 “Brute Force” starts out with aerialists performing acrobatics against a wall covered with a tarp. They appear to be weightless, and it looks like so much fun. The pool descended from the ceiling until we could barely touch it. Performers in the pool above us. 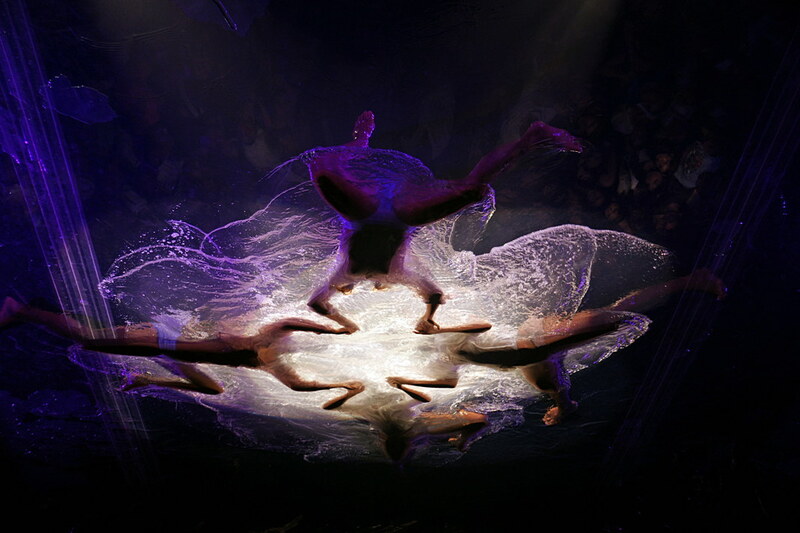 And we are treated to a water ballet, seen from below! The ceiling pool ascends, and a running track is wheeled into the room. 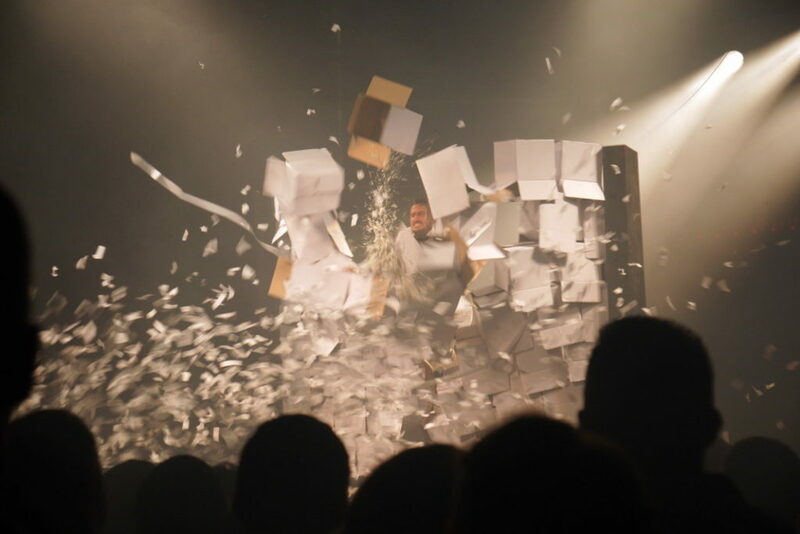 A man starts running as objects are moved past him such that he must charge though. We don’t know what it might represent, but it is visually stunning. 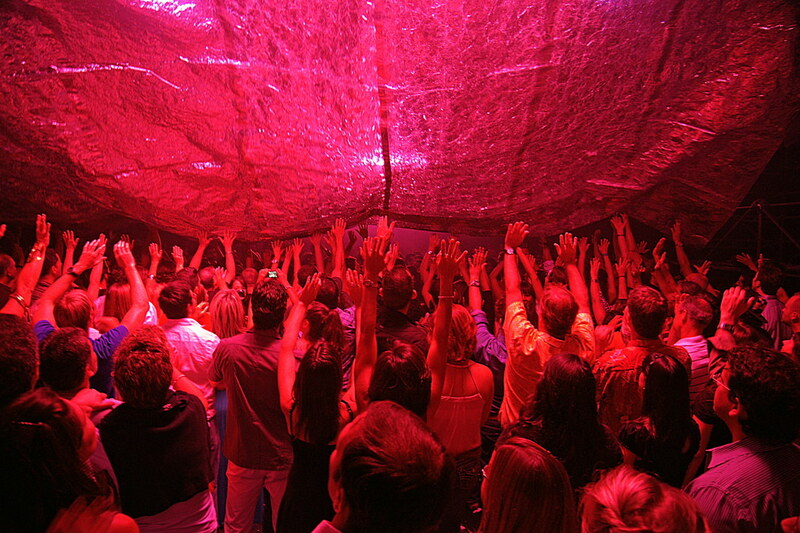 The show ends, and the cast takes a bow. Or, in this case, takes to the air! A short walk down Ocean street is the famous Palace Club where all the best queens go because every queen needs a palace. And it’s where we’re are going, too. We have a table outside, but at the Palace, it doesn’t matter because that drag queens spill out into the street. And I love them for lovin’ me. It is beginning to rain, but the show must go one. The queens continue to belt out one song after another. Stage? The world is our stage! Traffic slows as drivers brake to take in the show. The girls treat them as guests and have as much fun with them as they do with us. 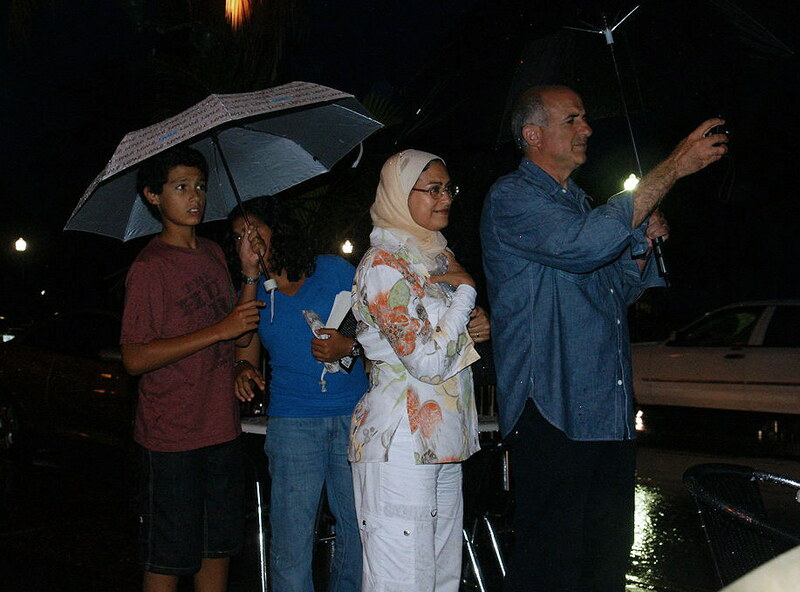 Tourists gather to watch the show. You can’t help but love a good drag show. The show ends, and the girls mingle and pose with their fans. Finally, it’s late, and we are heading back to get some sleep. 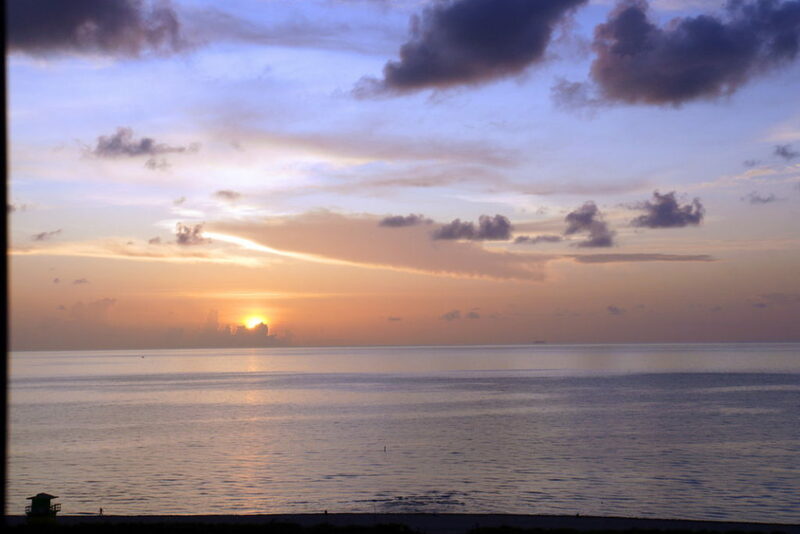 We never fail to appreciate the sunrises in Miami. We Californians never get to see this, and the fact that we can see it from our living room balcony makes it even better. 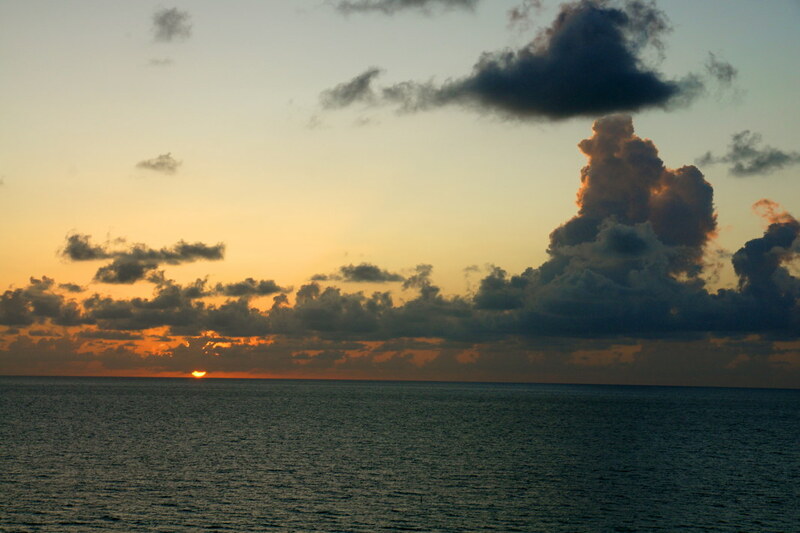 A beautiful sunrise over the ocean. We have come to appreciate, too, the cloudy weather. The rain is gentle, and the clouds give depth to the sky as the sun paints the day. We are having a great time, but it’s time to return home. Adiós, Miami, until next time. awa Travels Tip: We are open to all that a local culture has to offer, from alligators to bay cruises to day cruises to unplanned road trips to au natural bars to off-beat performances to drag queens, because life is a (wacky) adventure, or it’s nothing.